Accompany Steve to the enchanted Hawaiian isle of Kauai and watch what he gets up to, in two utterly original, upbeat, and practical videos about fabricating your own functional gymnasium from found objects. Buy both episodes together and save: Only $24.99! Download the complete series now! 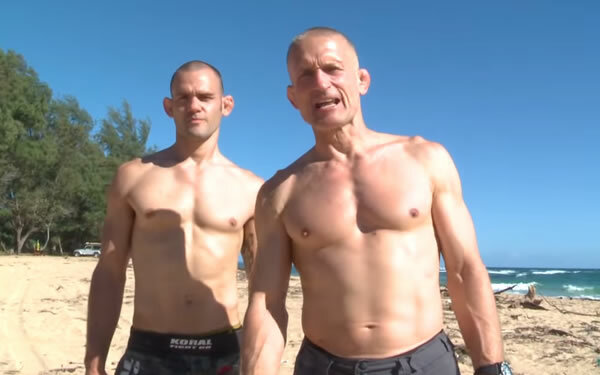 In Episode 1, Steve and his student, Scott Burr, like two industrious castaways, scour the beach for flotsam and jetsam, constructing a push-pull-squat corner in Paradise to get their workout on. While you might find yourself envying their Gilligansian Eden, Steve's essential message is that anyone can buck conventional notions of training and equipment and do the same. Never one to equate circumstance with limitation, Steve pursues his fitness dream anywhere, anytime, any place. Quoth Steve: Fitness takes no vacations! Episode 1 is about 30 minutes long. In episode 2, Steve first demonstrates his own solo workout, then coaches Scott through a comprehensive kettlebell and club routine. Those of you who've been waiting for a bona fide Maxwell club workout with his signature sequencing -- this is your download. Chock full of Steve's commentary and practical advice, get set for the best of efficient club and KB training. As usual, out of the hundreds of confusing possibilities, Steve distills the best four movements in kettlebells and clubs, in complementary matched pairings. Be inspired! Episode 2 is about 25 minutes long. Some days ago I purchased the latest video set of two of Steve Maxwell. Again a highly recommended work by the coach himself. 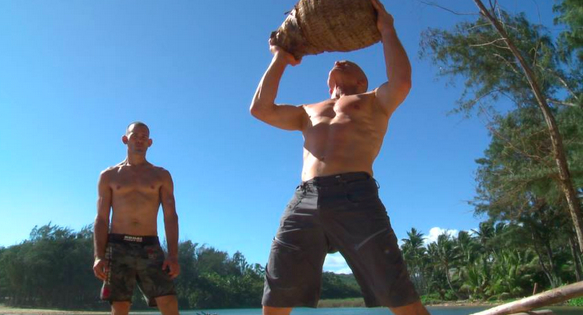 Filmed at the beautiful location Kauai/Hawaii you get an instructional BWE workout which will serve you a long time. Escalating Density Training is a great tool. Easy to adapt to and your needs, you do not need to perform any additional cardio or HIIT Circuits which will leave you burned out. Personally I do not like HIIT and I do only some sprint work about 5-8 seconds to keep lactate away. The second video gives you a kb/club hybrid workout with outstanding instruction by Coach Maxwell. Wisdom and humor are included. I prefer a 5x5 protocol for the kb/clb workout. Always appreciate the debunking of myths by Steve which many trainers use to confuse and lure trainees into their so called magical System. I also recommend to purchase additionally the KB Basics, KB Seminar, Clubbs Basics and Seminar with BWE Basics. With these you have life long personel training gym at hands at all times.